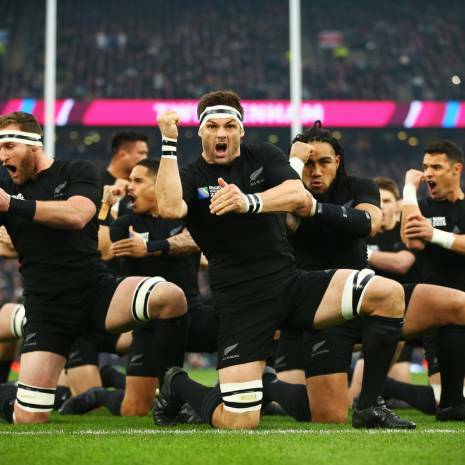 The Rugby World Cup is coming to a climactic close. The two teams left standing are undoubtedly the two best in the world. Whoever wins will become the first nation to be crowned world champions for the third time. Whoever wins will become the first nation to be crowned world champions for the third time. The pressure on both camps will be immense. They’ve both had phenomenal tournaments so far and below we’ve highlighted some key statistics from their games ahead of the final showdown. It’s worth noting that although New Zealand edge most of the statistics below, Australia have had the harder path to the final. These teams couldn’t be closer. 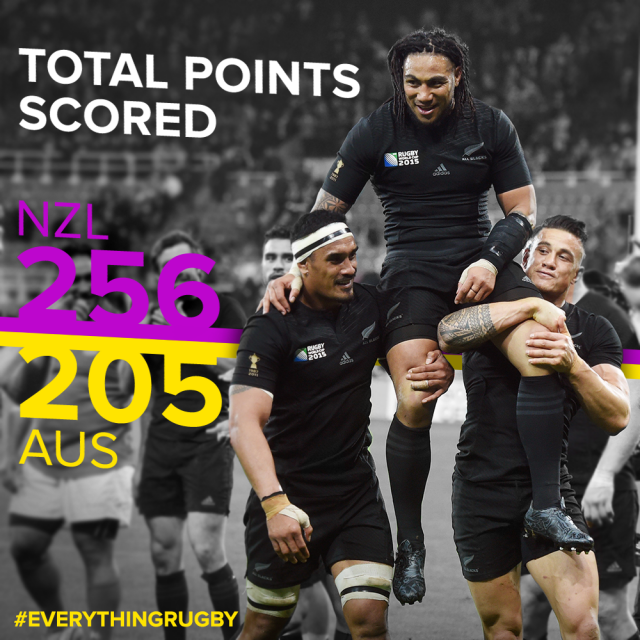 RWC 2015 has had an almighty amount of points scored. The score lines were big in the knockout stages, never mind the group stages. 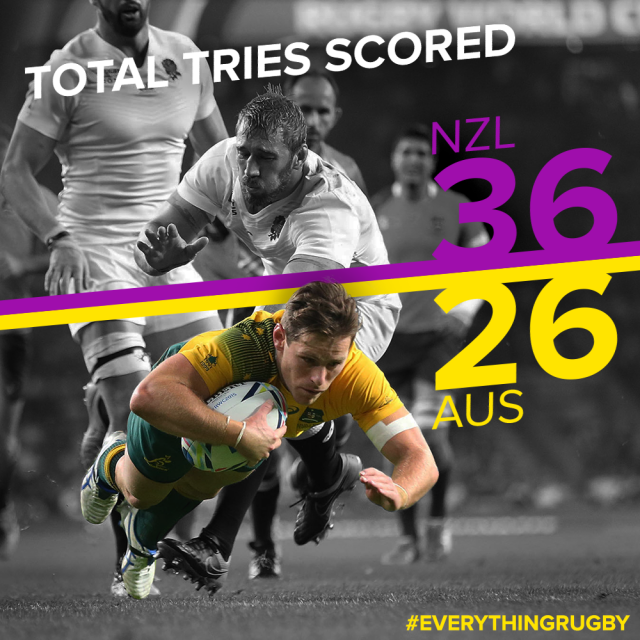 Both Australia and New Zealand have been amongst the highest scoring teams and have made watching them rack up their tallies a joy to watch. Given the quality of these two sides, the Final is likely to be the closest game (and potentially lowest scoring) of the tournament. Neither team conceded a try in the Semi-Finals, thanks to the solid defensive efforts of both sides. 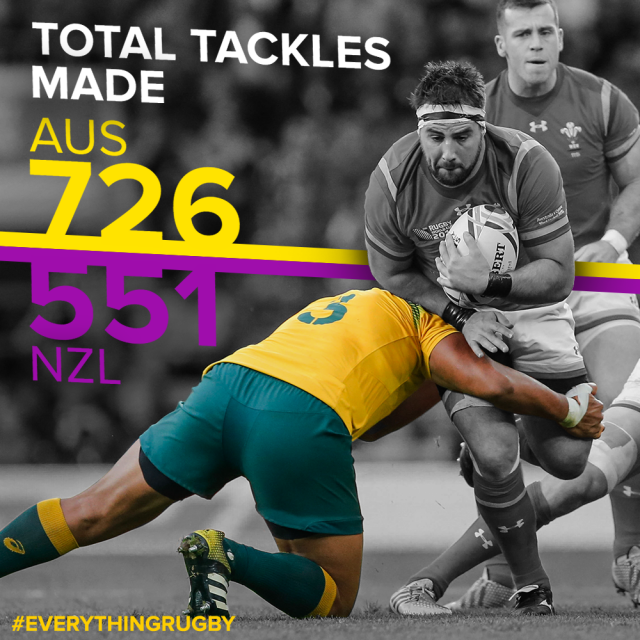 While Australia’s attacking flair has been on show for the whole tournament, their defensive effort against Wales with 13 men was nothing short of extraordinary. They then put in even more tackles against an Argentinian side that the previously zipped through the Irish defence with ease. We can’t wait to see what happens when Savea and Skudder come up against this defence. 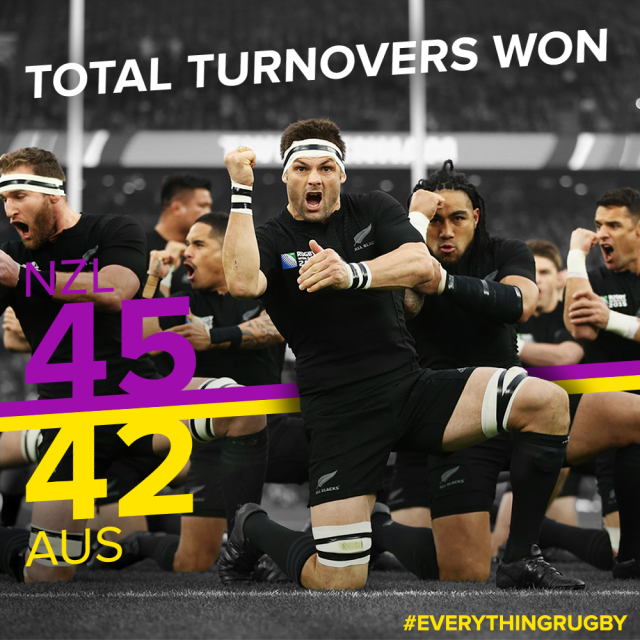 Some of the best tries of the tournament have come from these teams. New Zealand’s Quarter Final against France in particular, was an absolute try-fest. 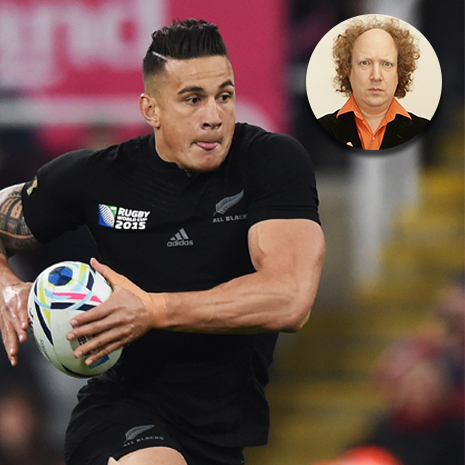 Savea ran rampant, and will be a top priority for the Australian defence. The Wallabies will also attempt to deny as many offloads as they can which has been one of the key components of the All Blacks try scoring machine. Both teams excel at the breakdown and turning the ball over has not only stopped their opponents attack but created opportunities for themselves. Hooper and Pocock have been amongst the most talked about players of the tournament and their work at the breakdown has earned them both nominations for Player of the year. Let us know who you think will win over on Twitter or Faceboook.